The prime minister's trip to his Lok Sabha constituency Varanasi will be his second visit there in the last two months. 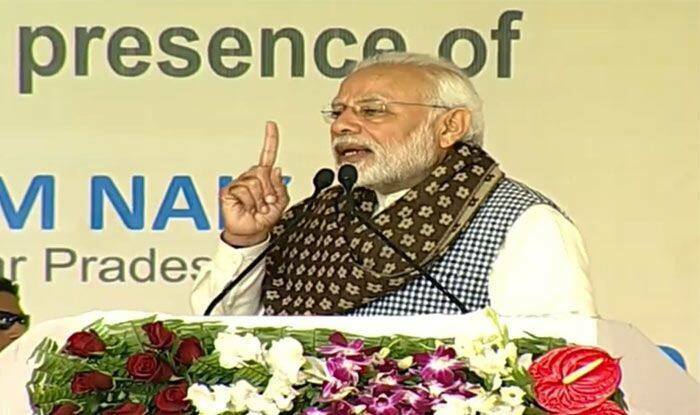 Modi in Varanasi: Launching the SAMPANN (System for Authority and Pension Management) scheme, PM said,”Our govt has tried to reduce the troubles of pensioners who had to run govt offices for their money. Now the pension department will do all the work from clearance to deliverance by itself. Now they can track the status of their pension online sitting at their home. Modi in Varanasi: UP govt’s ‘One District One Product’ is an extension of Make in India project. This will bring the state on the map of global enterprises, claimed PM. Modi in Varanasi LIVE updates: Prime Minister Narendra Modi inaugurated the rice research centre in Varanasi. Varanasi: Prime Minister Narendra Modi on Saturday laid the foundation stone of a medical college in Uttar Pradesh Ghazipur. He also released a commemorative postal stamp on the Maharaja Suheldeo. Following the inauguration ceremony, PM Modi, addressing a rally at Ghazipur’s RTI Ground, attacked the Congress, alleging that the party befooled farmers in Karnataka in the name of loan waiver. Amid growing discontent amongst allies in the ruling alliance in Uttar Pradesh, Prime Minister Narendra Modi is on a visit to Varanasi and Ghazipur, the areas where two NDA allies have considerable influence. The prime minister’s trip to his Lok Sabha constituency Varanasi was his second visit there in the last two months. He inaugurated the International Rice Research Institute (IRRI) and South Asia Regional Centre (ISARC) on the campus of National Seed Research and Training Centre (NSRTC) in Varanasi. PM Modi will also attend the ‘One District, One Product’ Regional Summit at Deendayal Hastakala Sankul (Trade Facilitation Centre & Crafts Museum) in Varanasi. Senior minister in the Yogi Adityanath government and SBSP president Om Prakash Rajbhar, an MLA from Zahoorabad assembly constituency in Ghazipur district, announced that he will not attend the prime minister’s programme. “I will not attend the December 29 programme of Prime Minister Narendra Modi in Ghazipur,” Rajbhar had told reporters a few days back. According to reports, Rajbhar is sore over the commemorative postal stamp on backward caste leader Maharaja Suheldev Rajbhar not carrying his full name. Also, Rajbhar has been alleging neglect of smaller allies and had even met BJP chief Amit Shah over the same complaint. With the Rajbhar community constituting a significant population in the Purvanchal, the BJP had joined hands with the SBSP to woo the OBC community during the 2019 assembly elections and had even made its chief Om Prakash a cabinet minister in the state government. However, the saffron party is focusing on BJP leader Anil Rajbhar, who is an MLA from neighbouring Chandauli district and is also a minister in the state government, according to a report in The Indian Express. Meanwhile, a problem has arisen with the Apna Dal (S), which is represented in the Union government by Anupriya Patel, an MP from Mirzapur, adjacent to Varanasi. Reflecting the “friction” with the BJP, Anupriya Patel said she stands by the remarks of her husband and party president Ashish Patel, who had voiced frustration with the saffron party over its “treatment” of smaller NDA allies. Ashish Patel had recently alleged at a press conference in Mirzapur that smaller parties were feeling “ignored” by the bigger NDA partner — the BJP. The Apna Dal (S) has presence in over 15 of the 80 Lok Sabha seats in Uttar Pradesh, with its core voter base of Kurmi Patel, and nearly one lakh of them only in the prime minister’s constituency.